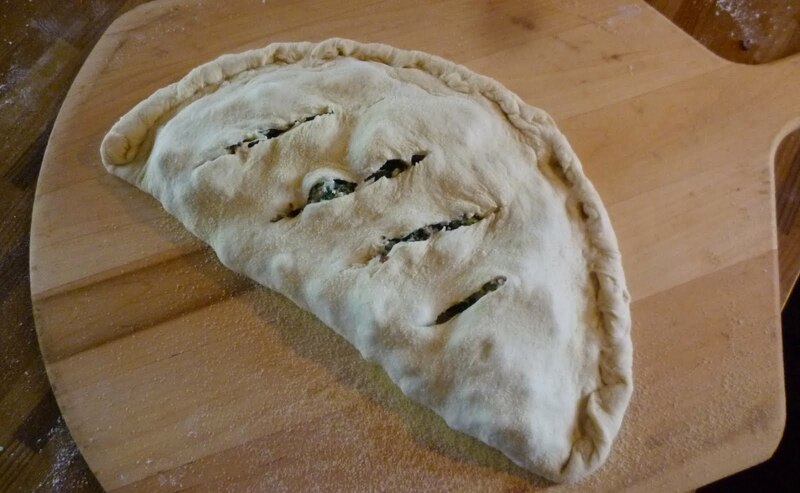 A calzone falls into a category of foods that I like to call blank canvases.....foods that can be used as a foundation for endless variation and improvisation according to the foods that are in season and the contents of your pantry. Pasta falls into this category....as does pizza, frittata/Spanish tortilla, grain pilaf, short pastry crust, and salad greens...just to name a few. 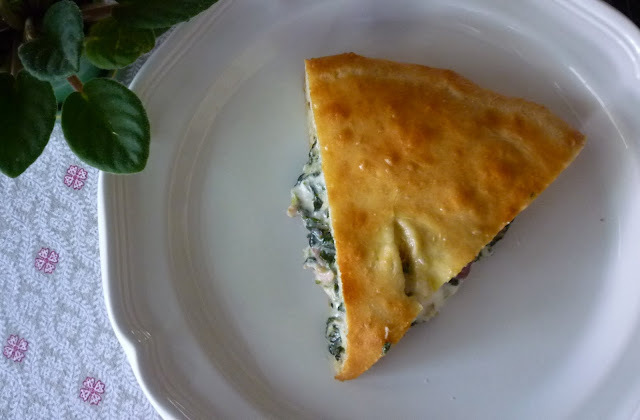 Calzones are, after all, very similar to a pizza....the filling is simply enclosed in the folded dough instead of being spread over a flat round of dough. And of course you can fill it with a wide variety of delicious cooked meats and vegetables, cheeses, etc...just like pizza. I do occasionally use the idea of the calzone as a blank canvas. 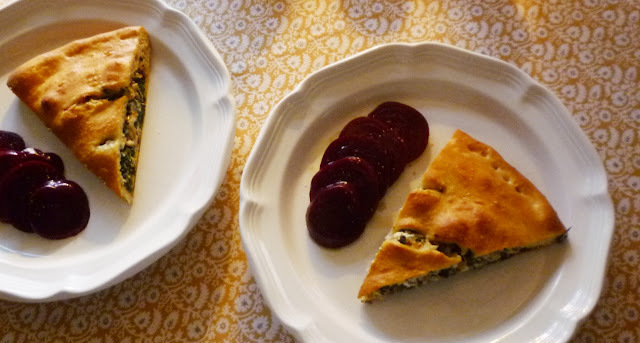 I posted a particularly delicious improvised calzone filled with winter squash, mushrooms and apples a little over a years ago. But to be honest, this was a bit unusual. 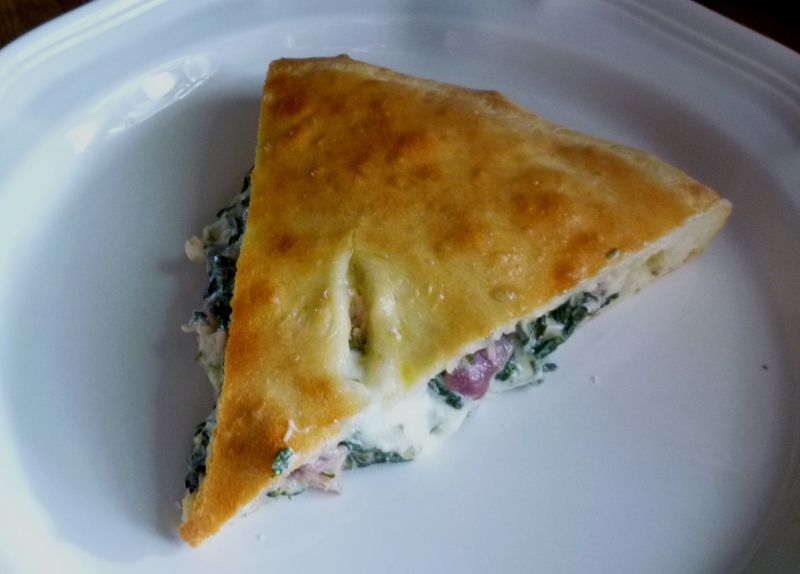 When I think of a calzone, I usually think of only one type of filling: a big mass of cheeses—mixed with wilted greens (preferably kale) and bits of prosciutto. 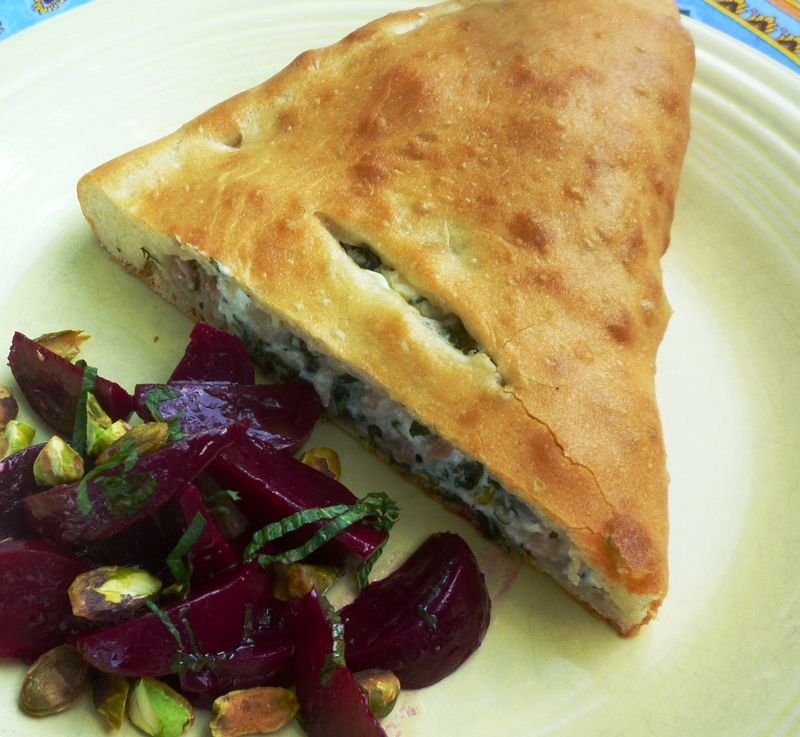 It has always been my intention to post the recipe for this, my "go to" calzone, but for some reason I have never gotten around to it....until today. I am calling this a "Four Cheese" calzone because it almost always ends up that I make it with four kinds of cheese...but I imagine you could limit yourself to just one...or two. The ricotta is the main event for this filling. Make sure you purchase a good quality, whole milk ricotta. (It should contain nothing but milk, vinegar and salt. If it seems a bit wet, let it drain in strainer for a half hour or so before you mix it with the other cheeses.) If I happen to have some goat cheese—or think about it while I'm at the store—I like to include that too. 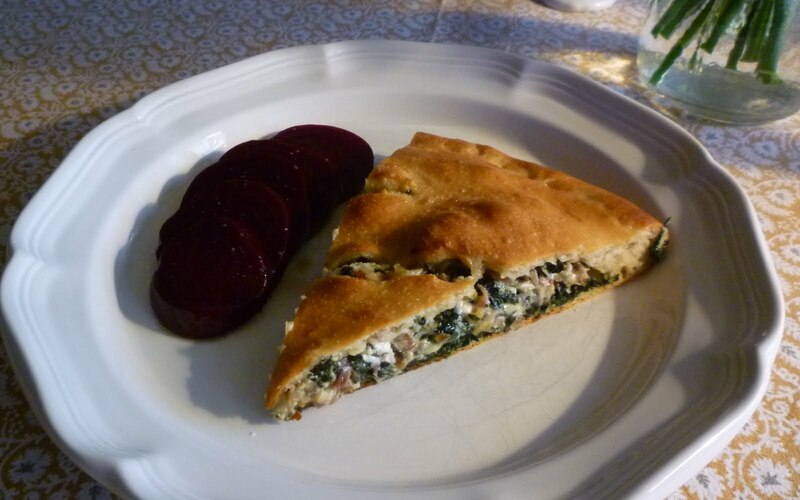 It has a texture that is similar to the ricotta, but has the advantage of adding a nice tang to the filling. I also like to add a well-flavored melting cheese...like Fontina or Provolone. Low Moisture mozzarella is nice too...even though it doesn't pack the flavor punch of those other two. And finally, I like to round out the flavor by adding just a bit of a hard grating cheese like Parmesan or Pecorino. As I mentioned, my preferred green is kale. I particularly like Tuscan kale (a.k.a Lacinato kale...or dinosaur kale...or Cavolo Nero). Kale has more of a presence—both in texture and flavor—than other greens. But I have used Chard too, with good results. I have never used spinach, but I imagine it would work just fine. I love the sweetness the caramelized red onions add to the filling. But in the spring I tend to use spring onions. I don't caramelize these...I just cook them until they are tender. Thinly slice 3 or 4—depending on their size—and include a quantity of the pale and dark green to equal the volume of the white. You could also wilt some scallions....or caramelize a yellow onion. You can of course vary the cooked vegetable that you add to the cheese filling. The volume of the cooked kale and onion is about one cup, so it could be replaced with once cup of some other favorite cooked vegetable—sautéed mushrooms, for example. If you really like cheese, you could omit the vegetables entirely and have an all cheese calzone (use a total of 11 to 12 oz of cheese). In fact, my recipe is a variation on an all cheese version I found many years ago in Alice Waters' book Chez Panisse Pasta Pizza & Calzone. It is worth noting that in a cookbook that contains many, many pasta and pizza recipes, there is only one recipe for calzone. Apparently it is not that uncommon for someone to become attached to one particular version of calzone. 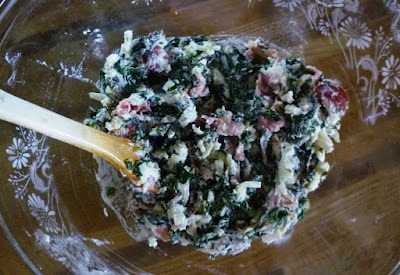 Make the dough: Place the water in a small bowl, sprinkle the yeast over and whisk in. Let sit until the yeast has dissolved. Place the flour and salt in the food processor fitted with the metal blade and pulse to blend. Add the oil and yeast/water mixture and pulse until the dough is homogenous. Begin to run the mixture in long pulses until the dough is smooth and elastic—about 15 to 30 seconds total processing time. If the dough seems wet and sticky, sprinkle in a bit more flour, a tablespoon at a time, pulsing after each addition. Turn the dough out onto a lightly floured counter and give it a few kneads by hand. Transfer the dough to a lightly oiled bowl and cover the bowl with plastic wrap. Let the dough rise until it has doubled in size—about 1 hour. Punch down the dough and turn it onto a lightly floured surface and form into a ball. Cover with a towel and let rest for 15 to 20 minutes. The dough is now ready to be formed into calzones. While the dough is rising, prepare the filling: Warm 2 T. olive oil in a medium sauté pan set over medium heat. Add the onion along with a pinch of salt and cook until very tender and lightly caramelized—about 10 to 15 minutes. Add the garlic and pepper flakes and cook until fragrant. Remove the pan from the heat. While the onions cook, cook the kale in a large pot of boiling salted water. When tender (after about 7 to 10 minutes), scoop the greens out of the water and place them in a colander to allow most of the excess water to drain. Spread the drained greens on a baking sheet and allow them to cool. When cool, pick up small handfuls of the greens and squeeze out most of the water. Roughly chop and add to the pan of cooked onion and garlic. Toss to combine. Taste and season with salt & pepper. In a large bowl combine the cheeses, prosciutto and kale/onion mixture. Taste and season with salt, pepper & a pinch of nutmeg. Build the calzone: On a lightly floured surface, roll the dough out into a large (13- to 14-inch) round. Transfer the round to a peel that has been dusted with semolina flour. 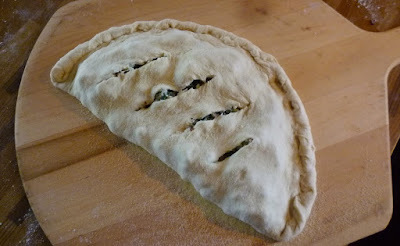 Place the filling on one side of the round or dough, leaving a half to one inch border at the edge. Lightly brush the bare edge with a bit of water, fold the other half of the dough over so that the edges meet. Roll and pinch the seam to form sort of a running crimped edge that is well-sealed. Slash the top with a sharp knife three or four times. Slide the calzone onto a preheated stone in a 500° oven. Bake until well browned and the filling is bubbling through the slashes—about 12 to 15 minutes. Transfer to a wire rack and brush the surface with olive oil. Let the calzone rest for a few minutes before serving (so the filling can firm up and so it won't be quite so molten hot when it is served....). The calzone may be served immediately or cooled and reheated. To reheat, heat the baking stone in a 350° to 400° oven and place the baked calzone directly on the stone until hot through—5 to 10 minutes. You many use any mixture of cheeses that appeals to you. I think at least 3 to 5 oz. of something soft—like ricotta and/or goat cheese is a good base. A good melting cheese like Fontina, low-moisture Mozzarella or Provolone is also a nice component—but you could also just increase your quantity of ricotta or goat cheese. And then a touch of an aged grating cheese like Parmesan or Pecorino to round out the flavor is good too. Aim for a total of 7 to 8 oz. cheese. The cooked greens and onions measure about one cup. If you like, you could create another style of "Four Cheese Calzone" by replacing them with the same quantity of another cooked vegetable (sautéed sliced mushrooms, for example). The number of people this calzone will feed will depend on appetites...and the other things being served. I like to serve my calzone with a salad (tossed green...grated carrot or roasted beet salad...etc.). With a salad and our lighter appetites, this serves four. If you have a large appetite...and don't serve a salad (or dessert) this will serve 2. The recipe is easily doubled to make two calzones. If you like, you may make 3 small calzones. Divide the dough into three balls after the first rise. Roll each ball into an 8-inch round. Divide the filling evenly between the three. Form and bake as for the large one. Three smaller individual serving calzone. Thank you for the lovely tutorial. 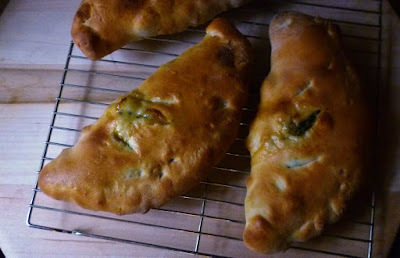 We love calzones at our house and I used to make them regularly for my daughter to take for lunch in high school, although mine were never as perfect looking as yours. I can't wait to show my daughter this post as she is enjoying cooking for herself as a college student. 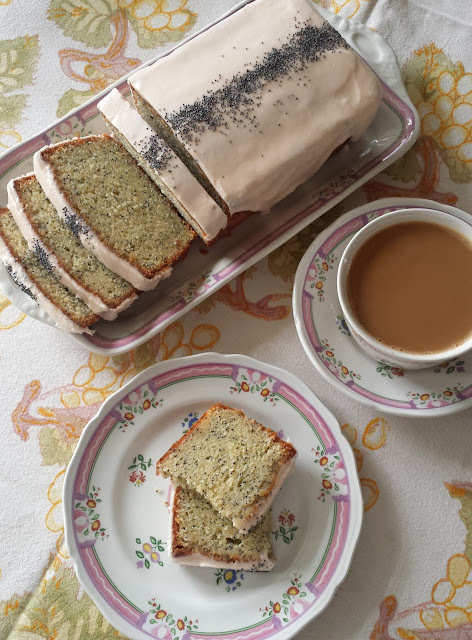 I have not commented recently as I am battling cancer and have not often been well enough to follow a new recipe and have it turn out successfully. I did however want you to know I read and thoroughly enjoy your posts and hope you will continue to post, even infrequently.